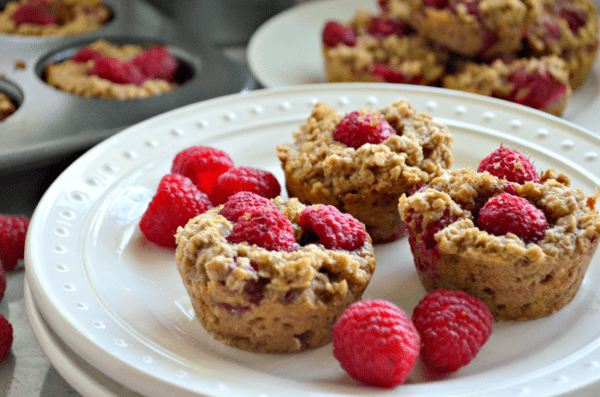 Get ready to elevate breakfast with a healthy twist on a classic breakfast favorite with my Banana Raspberry Oatmeal Muffins. Raise your hand if you feel like your always in a rush in the morning and have no time to make yourself breakfast! ME!!! I can make everyone else breakfast but taking the time to feed myself is always a struggle. Especially when I’m tending to two little ones, making preschool lunches, and trying to rush out the door to get to boot camp on time. I didn’t start eating oatmeal until after my son was born. It was only to help boost my breast milk supply. Over the years, I’ve actually started to like oatmeal. 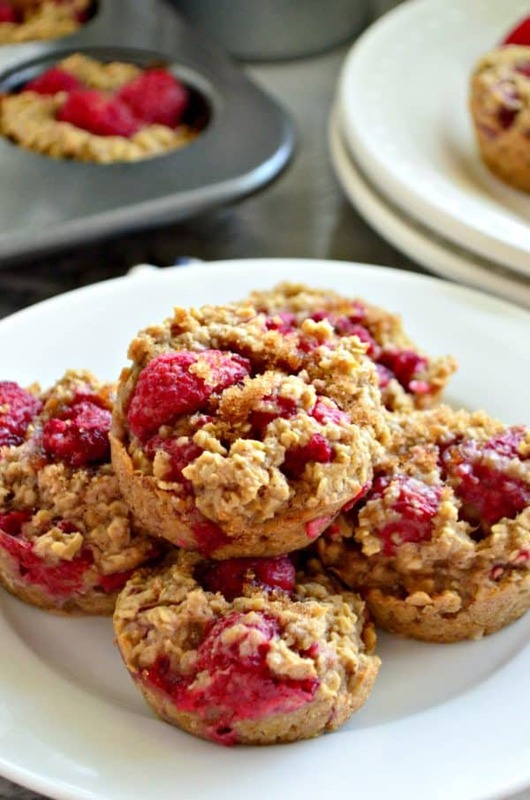 That’s where these oatmeal muffins come into play. Hot out of the oven, they taste like a freshly baked muffin yet are way healthier and keep me fuller longer. 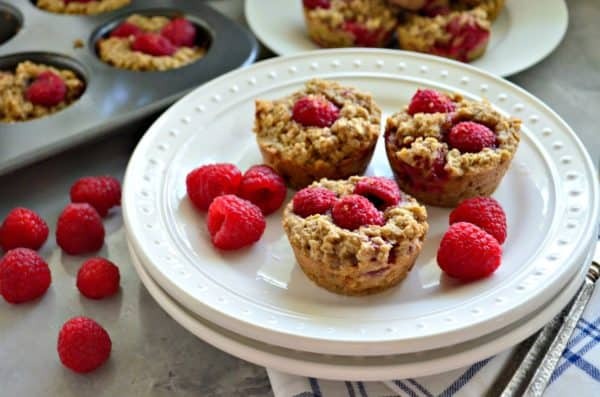 You can make these with a wide variety of fruits but I like them best with bananas (adds natural sweetness to it) and tart raspberries. They balance each other out and compliment the base of the oatmeal muffins. I’ve made these multiple times throughout the past year. I like to make a dozen–eat a few for breakfast while they are hot out of the oven and then refrigerate the rest to eat throughout the week. I’ve brought these to a friend who was sick and had a gluten allergy (and she loved them). I also brought them to a friend who had just came home from the hospital with a brand new baby girl. In fact, the day I photographed these my trainer came over with her son to play. We devoured these muffins–so much so that I had to make an extra batch to bring to our friend Shannon who had just had her baby! Oops! They are that good, y’all! Need these to be gluten free? No problem–sub for Bob’s Red Mill Gluten Free Oats. I’ve tried it and they work fine! Don’t have raspberries on hand? Add in blueberries, blackberries, or even chopped strawberries! So if you are in need of a quick and healthy-ish breakfast. 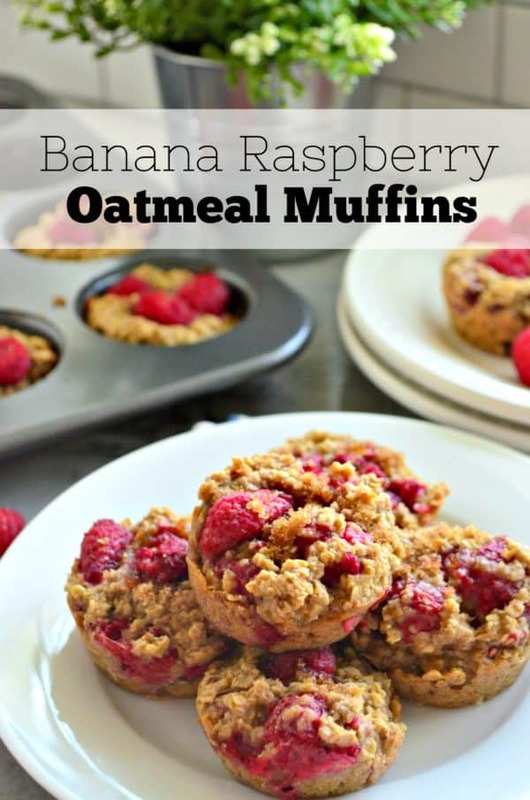 I really hope you’ll give my recipe for Banana Raspberry Oatmeal Muffins a try. Make them on a Sunday and eat them all week! Preheat the oven to 350 degrees Fahrenheit. Coat a muffin pan with nonstick cooking spray and set to the side. Carefully stir in the raspberries. Using an ice cream scoop--place one scoop into each of the the prepared muffin slots. Make sure you fill each cup evenly. Once the cups are filled place a few raspberries in each cup (pushing them down into the mixture). Then sprinkle a tiny little bit of brown sugar on top of each muffin. Bake for 25 minutes or until the muffins are golden brown. Let the muffins cool for 5 minutes, then carefully remove from the pan--serve immediately. Note: You can use gluten free oats and they work just fine! Reheat the muffins in the microwave for 25-30 seconds until warm. Store in an airtight container in the refrigerator for up to 1 week.